I am honored to be teaching two seminars at the 2009 Photo Plus Expo on October 22-24 in New York City. My first talk is “Shooting Stock: Creating Exceptional Work & Making Your Ideas Profitable” on Oct. 22 from 3:30 to 5:30 p.m., and is sponsored by Canon. The lecture will cover my proven methods for getting world-class shots while traveling light and using relatively basic lighting setups. The second seminar is “Real World Lighting, Real Results: Using Adobe Photoshop Lightroom 2 & Photoshop CS4 for Exceptional Travel and Outdoor Photography” on Oct. 23 from 3:30 to 5:30 p.m., and is sponsored by Adobe. Here I will share my Adobe workflow and processing secrets for outdoor sports, portraiture and travel images, especially when working with variable natural light. I hope to see you at these seminars! You can also catch me speaking at the Canon booth during the convention, where I will be presenting some of my latest multimedia and photojournalism work with the 5D Mark II cameras, as well as teaching Speedlite seminars; please check back for a schedule — I’ll post one as soon as it’s available. 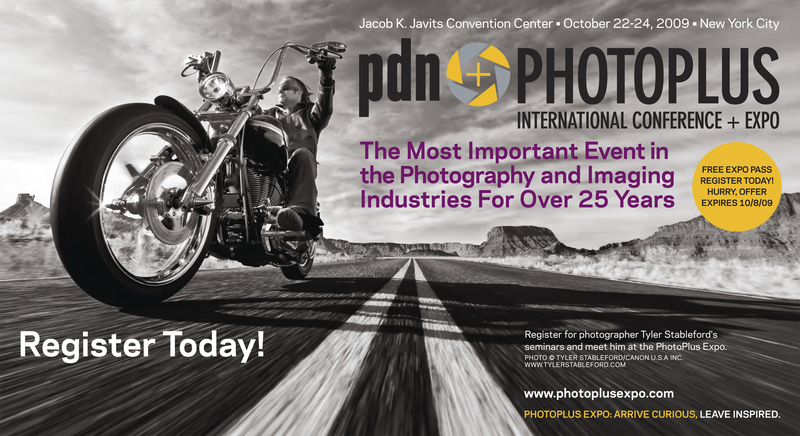 Thank-you to PDN for using my motorcycling image (above) in their campaign to advertise the expo! It is well worth it to attend this event, both for education and for the newest deals on Canon’s best gear. It should be fun for everyone, and this photo lecture set is a great opportunity to get out and work with new techniques and knowledge. I hope you will join us in New York!